When I open Logs in the PRTG web interface via the main menu, the log table does not load. The page remains empty and does not display logs, while the mouse pointer indicates that it is loading. Why can't I view the PRTG logs? How can I access the logs table? 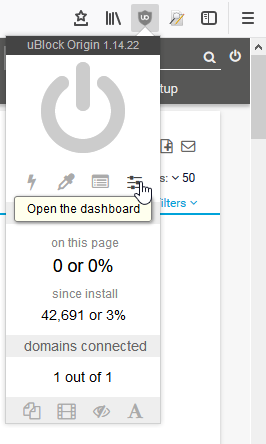 If you open Logs (<your-prtg-server>/log.htm) in the PRTG web interface via the main menu and the logs table does not show up, the reason most likely is that you have an ad blocker enabled in your web browser. Ad blockers like uBlock Origin block log.htm so PRTG cannot display the logs table or only after reloading the page (F5). We strongly recommend that you disable your ad blocker in a browser that you use to access the PRTG web interface! Ad blockers might affect other functions of PRTG as well. You can also whitelist your PRTG server in the ad blocker settings. If you use uBlock Origin, open its dashboard, open the tab Whitelist, and enter the address that you use to access PRTG via your web browser. Alternatively, click the big on/off switch to disable uBlock for the site. The PRTG logs table will now load again.